Crepe jasmine (also called crape jasmine) is a pretty little shrub with a rounded shape and pinwheel flowers reminiscent of gardenias. Rising 8 feet high, crepe jasmine plants grow some 6 feet wide, and look like rounded mounds of shiny green leaves. Crepe jasmine plants are not very demanding, and that makes crepe jasmine care a snap. Read on to learn how to grow crepe jasmine. 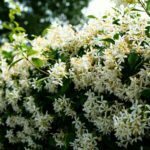 Don’t be fooled by the name “jasmine.” At one time in history, every white flower with a sweet fragrance was nicknamed jasmine, and the crepe jasmine is not a real jasmine. In fact, crepe jasmine plants (Tabernaemontana divaricata) belong to the Apocynaceae family and, typical of the family, broken branches “bleed” milky fluid. The shrubs flower in spring, offering generous amounts of white fragrant blossoms. Each has its five petals arranged in a pinwheel pattern. The pure white flowers and 6-inch-long shiny leaves of this shrub make it a great focal point in any garden. The shrubs also look attractive planted in a shrubbery hedge. Another aspect of growing crepe jasmine is trimming off its lower branches so that it presents as a small tree. As long as you keep up on the pruning, this makes an attractive presentation. You can plant the “tree” as close as 3 feet from the house without any problems. Crepe jasmines thrive outdoors in warm climates like those found in USDA plant hardiness zones 9 through 11. Although the shrubs look elegant and refined, they are not at all picky about soil as long as it is well drained. If you are growing crepe jasmine, you can plant the shrubs in full sun or partial shade. They require regular irrigation to keep the soil moist. Once the root systems are established, they require less water. Crepe jasmine care is reduced if you are growing the plant in acidic soil. With slightly alkaline soil, you’ll need to apply fertilizer regularly to prevent the shrub from getting chlorosis. If the soil is very alkaline, crepe jasmine care will include more frequent applications of fertilizer. Read more articles about Crepe Jasmine.